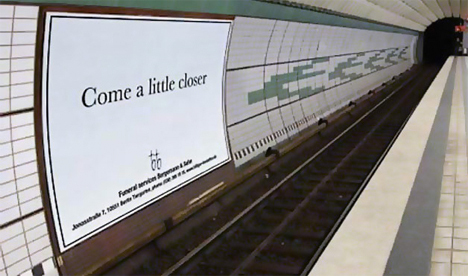 This billboard, reportedly spotted in a subway station in New York City, may not be the most tactful way to drum up business for a funeral home. But you have to admit, it’s clever. Naturally, the funeral industry doesn’t have too much trouble with supply – everyone dies eventually – but they have to compete with each other just like any other business. Are the ads that manage to stand out in poor taste, or just bringing a much-needed sense of humor to the realities of death? The Devanny-Condron Funeral Home in Massachusetts raised a few eyebrows with this billboard congratulating a local resident on her 100th birthday. Conflict of interest, anyone? 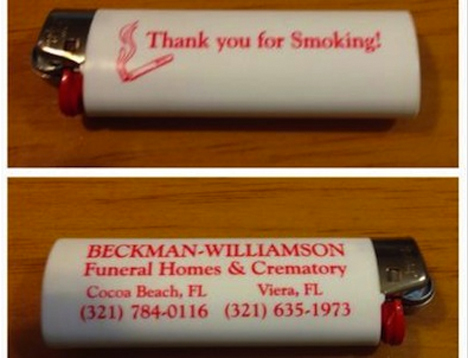 In Florida, the Beckman-Williamson Funeral Home & Crematory used a little dark humor to get attention in the form of ‘Thank You for Smoking’ lighters. These ads are funny, sure, but probably not helping diffuse the public perception of the funeral industry as a bunch of vultures lurking around waiting to pick at people’s bones. That’s especially true considering the hundreds of suicides and murders that take place on subway tracks, and the millions of smoking-related fatalities. 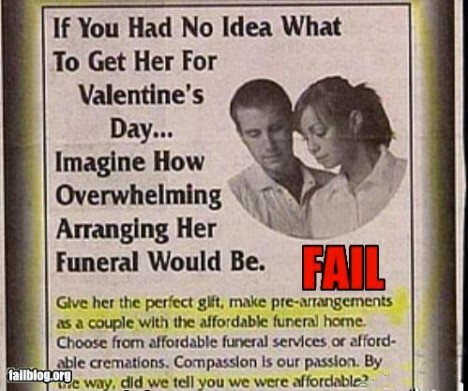 But other ads seen as insensitive – like the one below, touting funeral pre-arrangements as a romantic Valentine’s Day gift – are simply trying to call attention to a basic fact of life that most people ignore until the last possible minute. Attitudes about death vary wildly between cultures, religions and geographic areas, so it’s no surprise that what one person finds incredibly tacky is greeted with a smile and a shrug by another. The mere existence of cell phone-shaped caskets is enough to testify to that fact. And while it’s easy to laugh at things like Compton’s drive-thru funeral parlor (complete with bulletproof glass) – which many people see as cheapening the lives of the dead, making the mourning process as casual as grabbing a burger and fries – perhaps there’s more to it than that. After all, your attitude about death would probably be different if you lived in a place where drive-by shootings happen on a near-daily basis, and gang-related cemetery shootouts aren’t uncommon. If you’re interested in the demystification of mortality, check out the Order of the Good Death.